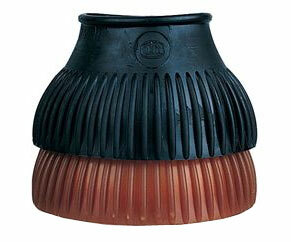 Quality bell boots from KL Select, made in Italy, are constructed with 100% gum rubber. This material helps the boots to stay flexible in cold weather, yet are very stretchy and easy to put on. The bell boots are designed with a rolled top to prevent rubbing in the fetlock area yet are thin enough to make them easy to put on the horse. The contoured, deep ribbing on the outside resists against brushing or banging. The boots are flexible enough to leave on 24/7, yet thick enough on the bottom to really protect your horse's hooves from interference.